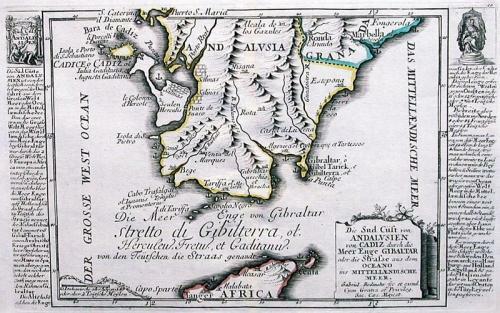 A detailed map of the Algecarias promontory in Andalusia, from Cadiz in the north to Gibraltar in the south to Marbella in the east. The map shows fortifications, anchorages, mountain ranges, towns and villages. A panel of text down each side of the engraving gives a description of the area including the fact that Gibraltar is derived from the name of Gibal Tarick, a Moorish Prince. Scarce. Fold(s) as given.